I was meandering my way through the cobblestone streets of Bratislava, craving another cigarette, when a beautiful sound enveloped me – drowning out my silent self-criticism at the acknowledgement of my growing cravings. I had been studying the brain during my train ride to this unfamiliar place, gaining more and more invaluable understanding of my happy chemicals with every passing mile. Happiness, I now realize, is the simple equation of a variety of our brain’s chemicals, and each experience of happiness is thanks to the presence of at least one: dopamine, serotonin, oxytocin, and endorphin. Dopamine – the seek and conquer form of ecstasy – aroused my senses as I imagined reaching into my purse, lighting up a cigarette, and breathing in. But being one who strongly opposes addictions, such as the one I realized was forming in me now, I made the message clear to my mammal brain: smoking is bad for your survival. Once again, I turned my attention to the lingering, calming sounds of the elusive music. My feet were aching from the hours of walking they’d endured the day prior in Prague, making way for an audible sigh as I entertained a slight downhill path between a row of tightly knit buildings. This is an arrangement, I began to realize, that is almost just as commonplace in Europe as the harmful habit of smoking itself. I realized I was headed towards the source of the music, with its growing apparentness, when I reached an illuminated break in the close quarters of the surrounding architecture. Nearing the line that marked the warmth of the sun, two ladies stopped abruptly, pulling out their phones to capture the image that lingered beyond the corner. 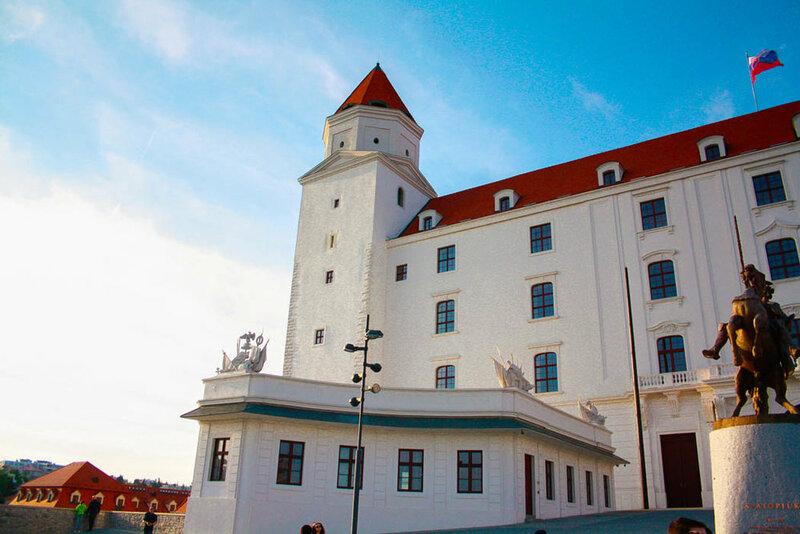 My mirror neurons fired, causing me to mimic their response, and by the time I reached the perfectly situated break that made way for a smile-inducing, narrow view of the Bratislava Castle, my SLR was firing, too. That monumental burst of dopamine (the one I’ve only experienced while traveling and the same one that keeps me from dreaming of much else) sent a clear message through my cortex. Though I’d arrived in Bratislava – a place I’d hardly heard of before – with apprehension and high cortisol levels that put me on red alert, the new message was written clearly in my mind: I love Bratislava. This spectacular sense of dopamine-high, which is easily accomplished through travel, is one that’s hard to describe – and once experienced – hard to shake. If only I could capture and bottle this ‘travel ecstasy,’ I’d be able to live my daily life with this unprecedented happiness. The warmth of the sun and the warmth of my inner excitement tingled all over my body as I clicked away, trying – unsuccessfully – to capture that travel addict high that presumably consumes the lives of millions of people every year, including myself. I knew it wasn’t working, and as the area grew quiet of shuffling feet and murmuring conversations, a new opportunity and thought occurred to me: maybe the feeling will be more apparent in the expression on my face. I dropped my bag in a safe place, and arranged my tripod to its upright position, setting everything in order before jogging into frame for ten fluid poses. Somewhere around the third or fourth frame, a sudden spurt of cortisol alerted me of a particular threat to my survival, or at least to my pride. It's the noise, as it turns out, that is most dreaded in these situations, unlike the beauty of the previously enveloping music or the dopamine-releasing pleasure of the camera's shutter. It was the noise of company. I finished my ten poses, the later half of the sequence rendering an alarmed facial expression, the very farthest thing from what I’d been aiming for, and quickly resumed my powerful position on the other side of the lens. They didn't leave when I finished, but continued standing and looking at me expectantly as I began to put my tripod back to rest. Before I could finish, one in the bunch, the leader I assumed, approached me. "Hey, can you get one of us?" he said, likely already knowing the answer, smiling wide and confident. Happy to be approached in my native tongue, I complied willingly, holding out my hand that expected to receive a strange mobile device as he turned his back and signaled to his clan. They gathered in front of my camera's lens, and soon enough I was graduated from 'DIY self portrait taker’ to what I assume they thought of me as: professional photographer. "Do something funny," I demanded, third frame in. I smiled as the majority of them looked around at their counterparts, confused at what to do, and as my demand 'clicked' in their minds, my camera did the same, capturing their raised arms and open mouths, leaving behind their happy howls to explicit, exclusive human memory. Serotonin flooded my brain, bringing my mouth to that long-missed, socially induced smile. I walked the opposite direction, through an arched passageway that would ultimately lead me to discover the true charm of Bratislava's Historic Center, when I met the source of the beautiful, enveloping sounds: a lovely, elderly man. A solo violinist. My obligation was clear to me immediately, and a promise I'd made to someone I love dearly – which is the type of love that evidently pushes you to be a better human being – kept me from getting out of it. I pulled out a few coins (admittedly of the wrong currency) and set them next to the lonely Euro resting in the velvet interior of the violinist's bank account. The violinist made eye contact with me as I rose from the act that ensured I kept my promise, as well as my connection, to my loved one back home, revealing his true appreciation. Interrupting his song with words of gratitude, the brief connection sent me into the best kind of chemical-induced happiness: oxytocin. I settled into a nearby restaurant patio, still within audible range of the violinist’s music, and ordered my growing favourite: a chicken schnitzel. As my stomach became full, the distraction of my growing hunger left me, leaving my mind’s focus to return to the ponderings of life I’ve always been so drawn to. I thought of my future, the vast unknown, and recalled all of the blessings I’d encountered over the prior months of travel, feeling grateful for all of the happiness and all of the loneliness, too. On my walk back to the train station, I took a moment to sit and watch sundown while resting my poor, aching feet. Realizing that they were much worse off than I had realized throughout the day, swollen and blistered, I smiled at what I deemed masked the pain, and perhaps even added to the ecstasy of my day: endorphin. Though I acknowledged what this moment would be ideal for, and what I’d also be allowed to enjoy according to my previously agreed upon arrangement with myself, I couldn’t help but acknowledge something else. My cigarette cravings were no longer there. Perhaps, I realized, my day in Bratislava had filled me so full of all the various forms of natural happiness that I no longer required its temporary form. And to my satisfaction, I realized that I had somehow rendered the feeling of love and relieved the feeling of loneliness during the day, too. Whether it’s possible to feel this particular kind of happiness from a brief connection with a stranger or just by keeping a promise to help others in every way you can which further connects you to someone you love, I knew that my day in Bratislava had flooded me with its undeniable chemical form. Even though I was explicitly alone. Meet your happy chemicals, too.